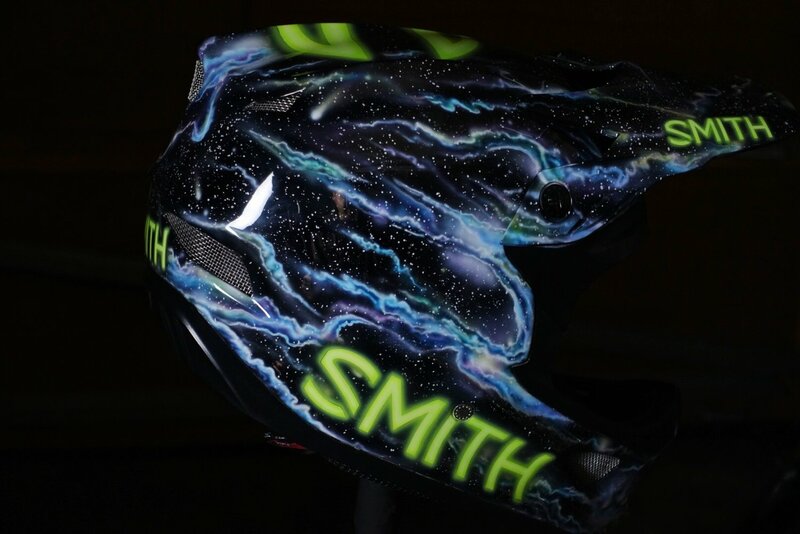 Hard to imagine what kind of head injuries Marco would have sustained without this Troy Lee D3 Mips helmet. 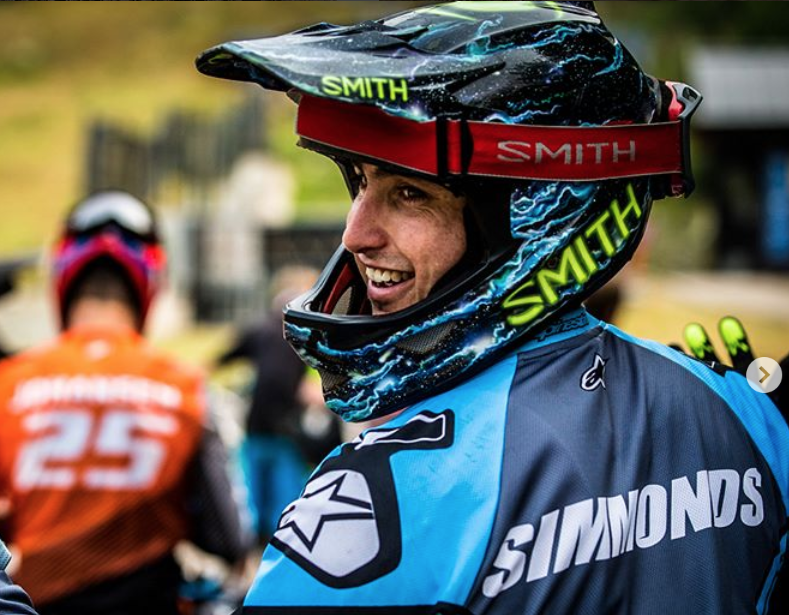 On August 26, EWS racer Marco Osborne was competing in the Northstar California Enduro Series with a firm grasp on a podium spot duking it out with world-class racers Richie Rude and Curtis Keene. On the stage 4 finish line though, he went very big on the final jump and things went awry. 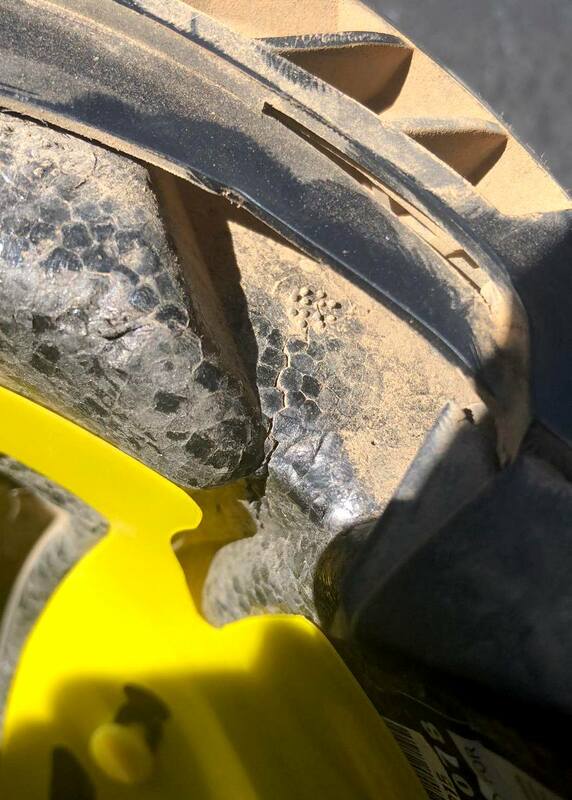 What occurred next was what some witnesses described as the ‘gnarliest crash they’ve ever seen.’ There’s no footage of the crash but Marco’s helmet will shed some light on it. Marco did not sustain any broken bones or internal bleeding but a week later, he said he still felt like he ‘got hit by a truck.’ Given that Marco is built like a truck, that says a lot. He was dazed and sore all over for days after the crash. We’ll let him tell the tale. Marco Osborne helmet MadeRad by Tony Baumann is frequently set into orbit by Marco ‘Randy Simmonds’ Osborne of #senditrandy fame. 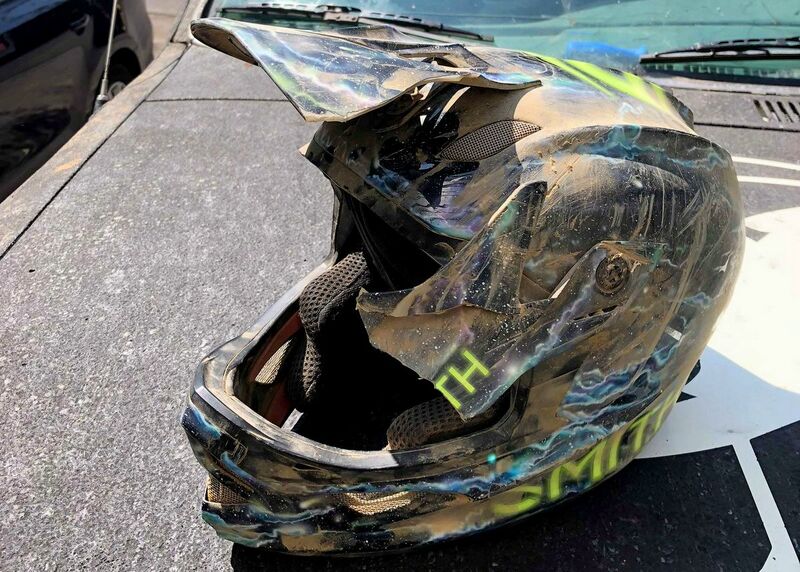 “My helmet flew off my head after rolling around the dirt a few times. It took me a while to get up and catch my breath. Iago Garay and McKay Vezina helped me off the track and waited until medics arrived. Fortunately, I didn’t have any broken bones or internal bleeding but was extremely banged up and suffered a good concussion. This is a glimpse into how Marco Osborne handles a bike. Marco has been riding around on an ebike near his home to help his body heal. He has some doctor check-ups and is hopeful he can do the last two EWS races. The helmet is a very special one indeed. 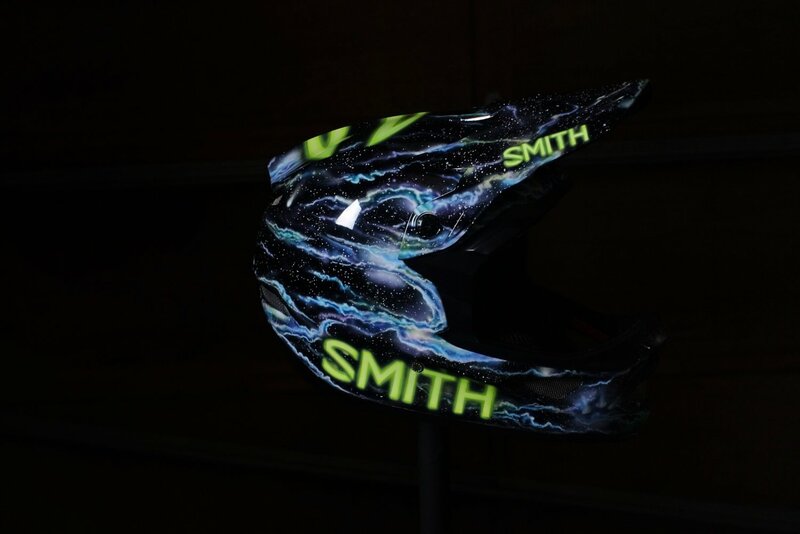 Sponsored by Smith helmets, they asked Marco what full face helmet in the market he preferred since they did do not produce one. Marco enthusiastically chose the Troy Lee D3 Mips helmet since it was the very best, in his experience. 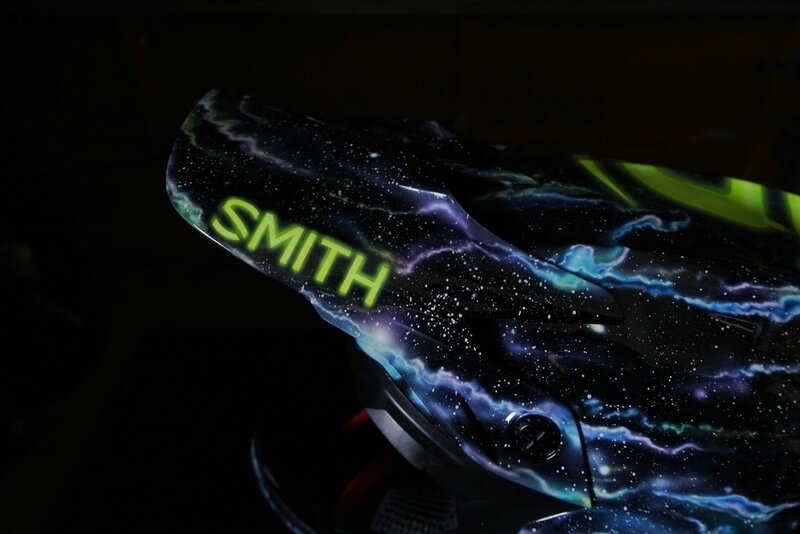 “Marco reached out to me at the beginning of the season and requested a galaxy paint job for his TLD D3. This would be the second one that I have done for him. Marco is always really easy to work with and he just let me run with it. I had been playing with the glowing neon effect and thought it’d be a good fit for the logo treatment on this one. When I’m in the zone and doing my galaxy thing, I often lose track of time. I’d guess I had around 20 hours in to it by the time I came back to earth and considered it finished. 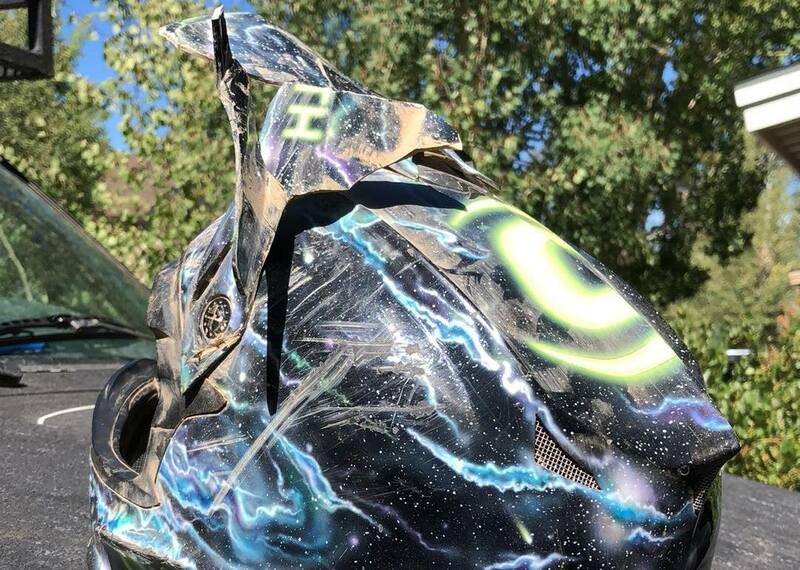 When I saw the smashed helmet pop up on my Instagram feed, it took a minute to register that the pile of space debris was actually Marco’s helmet. Such a bummer to see it obliterated like that, but very, very glad he’s okay. Front was damaged as well. Marco was wearing Smith goggles to protect his eyes. Unfortunately, when you put your art into motion and on objects that are made to be used at Marco-speed, you dramatically cut down on it’s estimated life expectancy. It’s a good thing that there are more helmets for Marco to wear and more paint for me to spray. Hopefully the two things will collide again in the future. 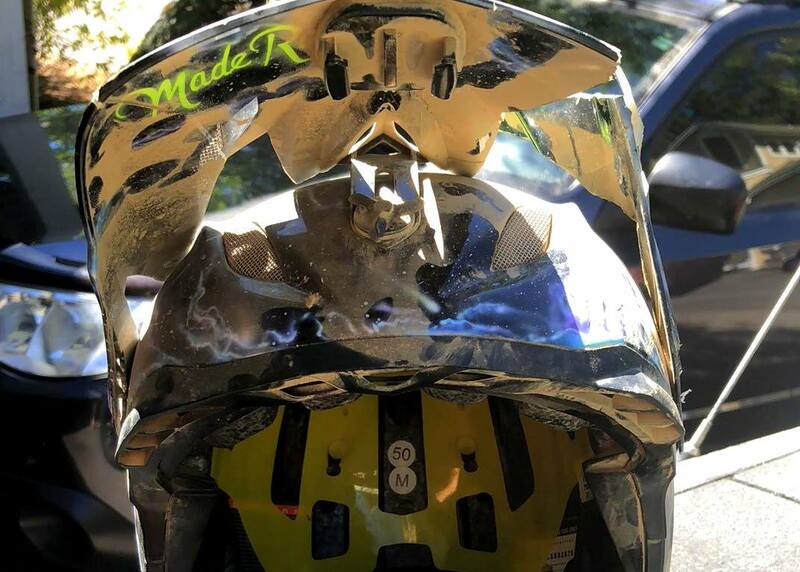 Made Rad By Tony helmets are available to the public starting at around $500 depending on design. We wish the best of luck to Marco Osborne in his recovery and future races. 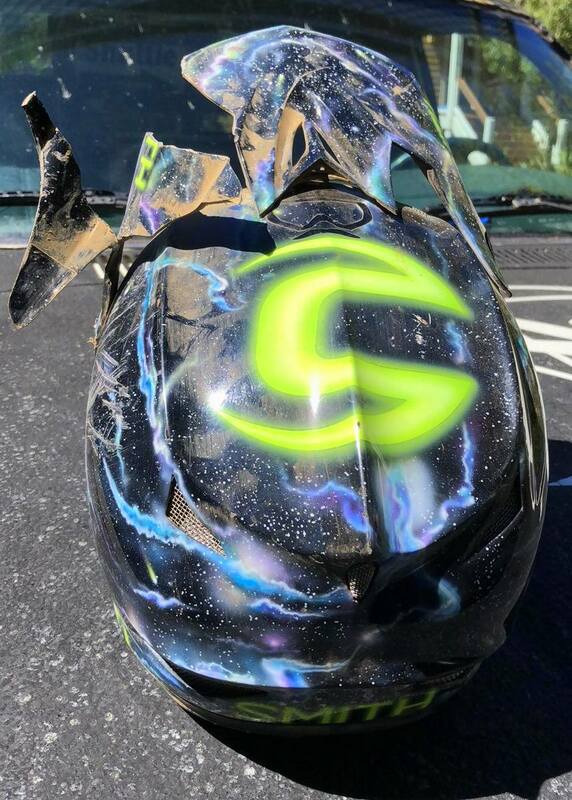 And remember, wear your helmet kids! 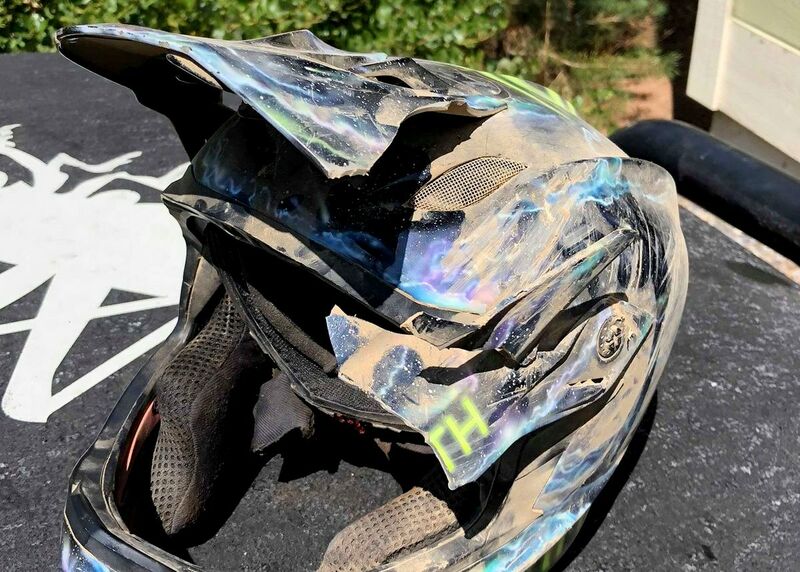 The Troy Lee D3 helmet was obliterated as it gave up its life to save Marco. A closer inspection reveals structural damage. Mips layer is seen. Hard to imagine what kind of injuries Marco would have sustained without this Troy Lee D3 Mips helmet.